By any objective measure, what Ram has done with its all-new pickup is remarkable. You can argue about the subjective things. Are the headlights too squinty and car-like? Perhaps. Is it acceptable to dump the famous ram’s head logo on the grille that links this truck to its rich Dodge heritage? I’m not so sure. 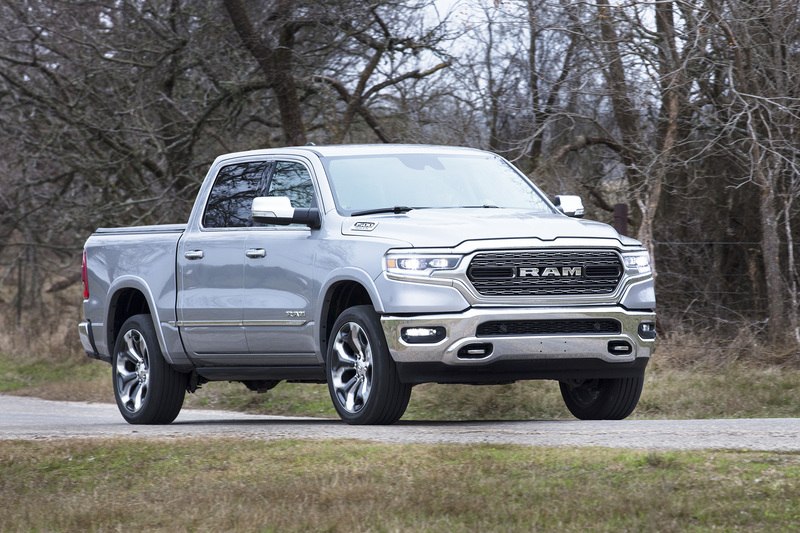 But judging from the numbers and the feel from the driver’s seat in the 2019 Ram 1500, this next-generation truck is unquestionably, indisputably impressive. That’s my takeaway after several hours driving different variations of this truck in the Arizona desert, both on-road and off, towing and unladen. It starts with being smoother, quieter and more car-like than any truck I’ve driven until now. Ram long ago switched to a multi-link rear suspension design that’s more expensive to produce but provides a noticeably supple feel over the road, figuring its customers would be willing to pay for the better ride. The all-new 2019 Ram 1500 keeps its oversize, big-rig-inspired grille for a new generation. It also proudly uses “RAM” lettering up front instead of the decades-old ram’s head logo. This new generation takes refinement a step further with an innovative, gutsy approach that leapfrogs other pickups on the market today. It combines active tuned-mass dampers on the frame and electronic noise cancellation in the cabin to make it eerily silent at highway speeds, especially for those of us who grew up around pickups that clunked, rattled and roared down the highway. The evolution has been unbelievably dramatic. A powerful but silky drivetrain adds to the refined feel. No matter how hard I pushed it — whether flooring it to merge onto a highway, braking hard in suburban traffic, or digging for traction in loose sand and gravel — the 5.7-liter HEMI V8 engine and eight-speed automatic transmission never once felt flustered. Seems the engineers have done some serious homework sorting out the small details, right out of the chute. Making the new Ram drive more like a car doesn’t hurt its capability, though. Thanks to increased use of high-strength steel and a beefed-up frame, it’s rated to tow up to 12,750 pounds when properly equipped. That’s the kind of performance that used to require the expense and drawbacks of a heavy-duty pickup in the past. Common sense would tell you that making a truck bigger, quieter and more capable might also make it heavier and thirstier at the fuel pump. But not in this case. The new Ram 1500 weighs around 225 pounds less than the old one, much of which comes from a frame that’s made of 98 percent high-strength steel. That alone saved 100 pounds, Ram claims. Aerodynamic tricks, including active grille shutters and an air dam that lowers at highway speed, make it the slipperiest truck for sale today, surely helping its fuel-economy numbers when the federal government releases them soon. The new Ram’s air suspension, a $1,795 option, offers several useful features in addition to a smooth ride. It can raise the rear suspension to keep the truck level when towing or hauling heavy loads. It can lower the truck to make it easier to hook up trailers at the hitch. It also can lower the entire vehicle at highway speeds to improve gas mileage, then raise it up higher for better clearance when driving slowly off-road. The new Ram has an impressively car-like driving feel with a smooth ride and quiet cabin. An optional 12-inch touchscreen dominates the dash like in no other pickup — and precious few luxury cars, for that matter. 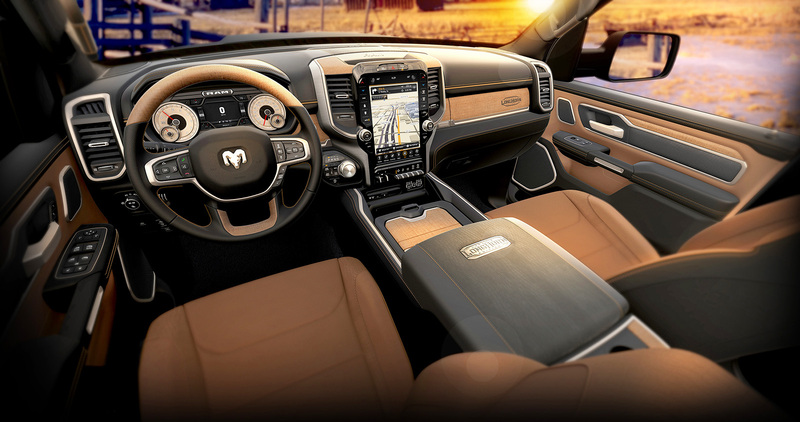 Finally, the new Ram 1500 throws down the gauntlet for in-cabin technology, culminating with a gigantic, 12-inch touchscreen that sends other trucks away whimpering in embarrassment. I could have spent this whole review writing about the things that huge screen lets you do, from streaming on-demand satellite radio content to showing all kinds of camera angles and easily configurable, split-screen entertainment options. It points to the future not just of pickups, but vehicles in general. Unfortunately, I didn’t have the chance to test one of the most interesting options on this truck: a mild hybrid system, called eTorque, that will soon be offered on both the V6 and V8 engines. It will boost both power and fuel economy, Ram says, something fleet operators and environmentalists should both be celebrating. Pricing starts at $31,695 for the Tradesman work-oriented trim and ranges up to $57,690 for a Limited crew cab 4×4 luxury truck. The Ram 1500 gets an all-new design that makes it more capable, refined and efficient than before. It can tow up to 12,750 pounds yet has a surprisingly car-like feel over the road.